I pose in the cornfield at near harvest time. If I had grown up in a more hospitable place, I’m confident that I would have been a farmer. I love growing food. I have turned my backyard into a garden. The front yard too. Even the grass strip between the sidewalk and the street is a garden – I have raised beds there that actually are my best place to grow food. Seattle is absolutely friendly to growing your own food, especially with all the extra sunny weather we’ve been having lately. I’ve already planted several different veggies, some of which are sprouting – peas, spinach, and carrots. I’m carrying five gallon buckets of water in this picture to water in our cornfield. The cornfield hasn’t sprouted yet so the red dirt and barren landscape really comes through. 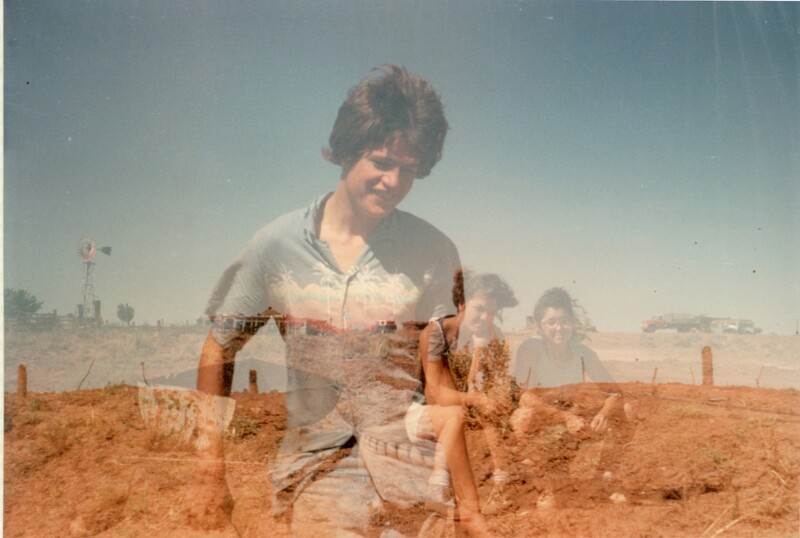 This photo is actually a double exposure so you see my sister and her friend sitting on the ground (admiring my hard work, I’m sure). The windmill and the main structures that make up “The Land” are in the background. It isn’t as easy to grow food in the arid, windy, and soil poor part of Northern Arizona where I grew up. We called it The Land. I’m not sure how it got that name, but it fits. It’s in the rain shadow of the San Francisco Peaks between Flagstaff and Winslow up against the Navajo Reservation. It’s extremely dry and windy. Nothing grows there except a scrubby, clumpy yellow kind of grass and saltbush. The soil is red and short on nutrients. The fact that conditions were poor didn’t stop my family from growing food. We always had a garden – sometimes small, sometimes big. We never grew all the food we needed but we certainly supplemented our diets with a lot of healthy garden plunder, mostly greens like spinach and Swiss chard. We also grew corn, squash, melons and veggies, especially corn. A few years we went big, and fenced off a large plot of land to grow the blue corn that the Hopi Indians like to grow on their mesas just a few dozen miles to the north. Me and my brother Cedar swimming in the Big Tank. We lived in the tank all summer – it was the only way to stay cool. We also used it to water our cornfield. 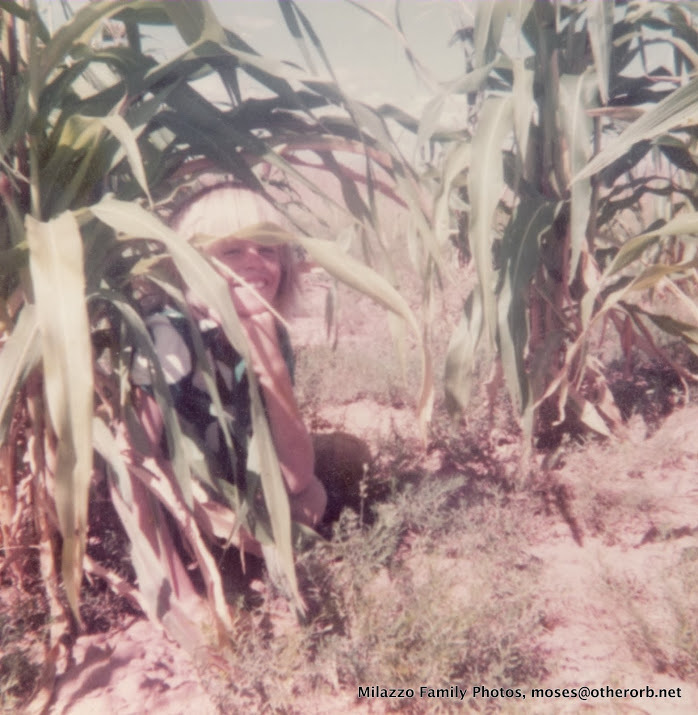 The Hopi watered their corn with springs that trickled out of their flat topped mesas. We didn’t have such mesas and certainly no springs on the 80 acres of high elevation desert that my dad bought in the 1960s. We did have a well and windmill that would pump water into the Big Tank, our swimming pool and watering reservoir. The circular tank, which stills stands today, is 6-feet tall and about 15-feet across. We lived in that tank all summer long – it was the only way to stay cool. 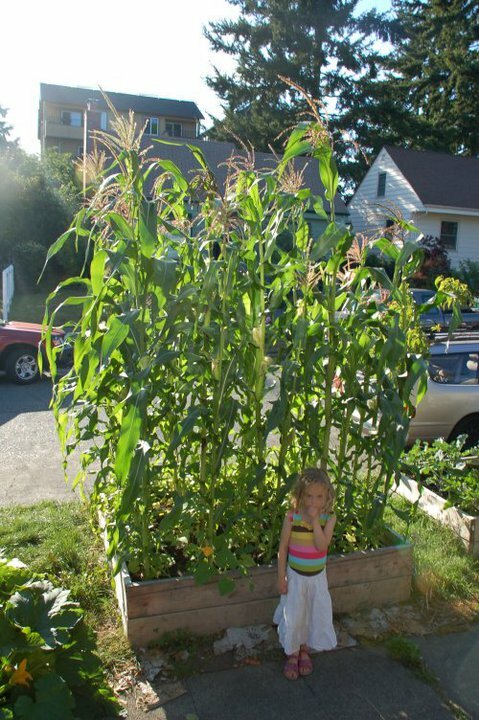 My daughter Lola stands in front of the corn that I grew in my front yard in Seattle a few years back. The corn grew tall but ran out of time (cold wet fall comes too soon here) to fully mature. We also used it to water our cornfield, which we smartly setup downhill from the big tank. And while here in Seattle I just turn on a hose to water my garden (not that I have to do that all that often with the rain), and boom, my garden is happily watered. Not so at The Land. We used gravity and a long black hose to fill up an old bathtub that we set up in the middle of the cornfield. We scooped up buckets (5-gallon doozies) of water out of the bathtub (two at a time – one for each hand) and watered clumps of corn one at a time. The corn was planted in clumps Hopi-style because that way it had the best chance of surviving with limited water (and let me tell you, water was limited). If I remember right, we dug a small hole for each clump, put a little soil in the bottom (not much), poured a fair bit of sand on top of that (probably 6-to-8-inches), and then covered the very top with straw. The soil fed the corn, the sand held the water in reserve so the corn could slowly drink it up, and the straw helped keep the water from evaporating and kept the pests out. Each clump got about one-fifth to one-quarter of a bucket. Pouring of the water was done very carefully as it would be quite a while before we got back around to watering again. And importantly, the windmill-Big Tank combo could only produce a limited amount of water that took a while to regenreate – you really had to spread things out and make sure you had enough for the entire field. My brothers and sisters and I helped our parents plant the field, and more importantly, undertake their extremely labor-intensive job of watering. It was hard work – I can vividly recall the buckets banging on my legs, scraping the skin raw and sloshing water down into my shoes (when I wasn’t actually barefoot). Growing a cornfield by hand like that was the hardest kind of farming I ever did. It’s all easy compared to that. I’m sure I complained at the time (not too much, I actually liked it even then). I think that work installed in me the desire to grow my own food as much as I can, and I think it did in my siblings as well. Most of them grow gardens themselves. There’s something about growing your own food that is really nurturing.